del Monte Publishing Co., 9780692064719, 168pp. "Sam Morse could out-imagine anyone," said Herb Cerwin, Del Monte PR man, drinking buddy and friend. Cerwin was right and he could have added that Morse turned these thoughts into reality. Morse imagined a place with a pristine coastline, green-belted and free of buildings. He imagined creating a playground for his wealthy sporting pals and gals. He also imagined he could go the distance with Kid McCoy, a professional boxer who took on all comers. His imagination never stopped sparking and he made things happen through force, charm, determination, teamwork and grit. It wasn't always smooth sailing, but it usually turned out to his liking, and he did go the distance (three rounds) in the ring with McCoy. This is the story of my grandfather, S.F.B. 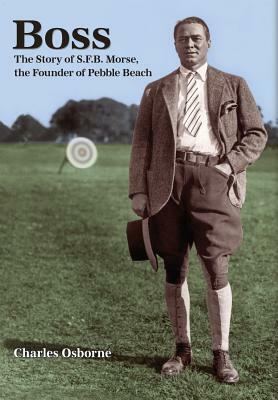 Morse, founder of Pebble Beach, California, my personal hero and an icon of the good life in his time. He was a classic big fish in a small pond, but a beautiful pond and he made that pond even more desirable. He dominated the Monterey Peninsula for fifty years and surprisingly, he was extremely well thought of by most everyone. His vision of land conservation was the basis for the creation of one of the most attractive pieces of real estate in the world.